Spending time with friends is always at the heart of hanging out with them. When I choose to be with someone in my free time a large part of the reason is because I do enjoy their company. Last Friday I grabbed a perfect opportunity to meet like minded friend Nayna of Citrus Spice and spent a lovely afternoon to catch up and have great time. 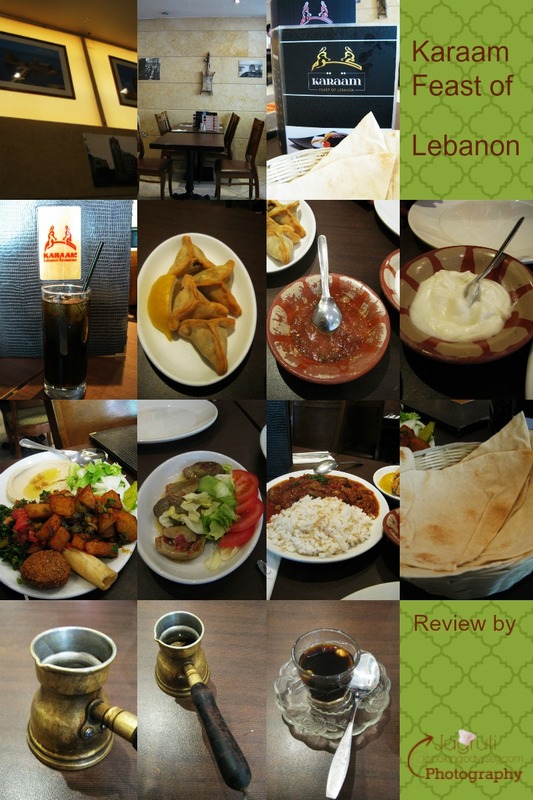 We were invited by emerz to visit this Lebanese restaurant on Ealing Broadway to be their guest for lunch and write a review, first we both checked the menu for vegetarians, luck was on our side. and we found quite a few delightful dishes. 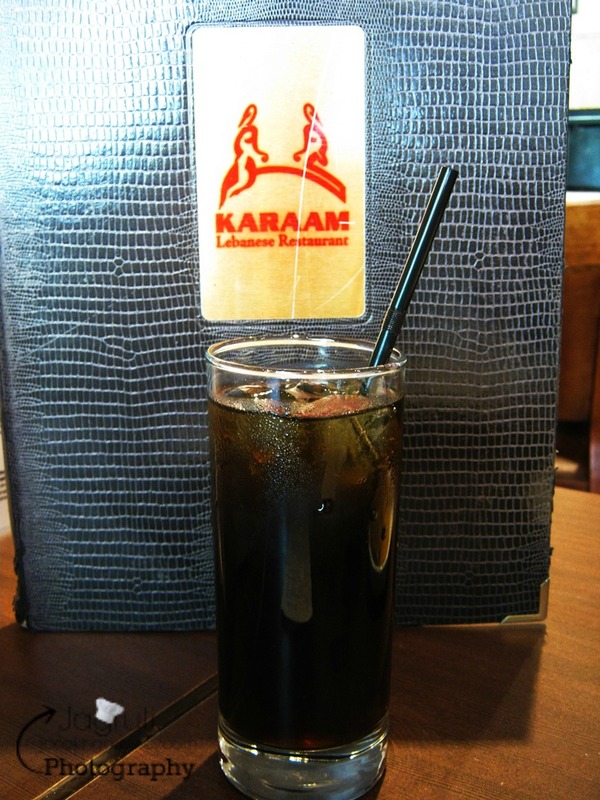 Karaam is situated in a very busy and main streets of London, on Ealing Broadway and not far from main shopping and business area, so it's perfect and spacious place for lunch or dinner after shopping with friends and families. We were greeted and welcomed, then asked to be seated. It was neat and clean, the ambiance is cosy and simple, and there are some traditional and unique designs and paintings to look at, Maybe, a little laid back in this particular department , but both food and drink lists are adorned with real stuff to offer the diner an experience that is genuinely authentic. Alcoholic drinks such as Lebanese beer and a variety of wines are available along with non alcoholic choices too . Because we wanted to experience Lebanese cuisine to fullest, we opted for a traditional drink Jallab, (£3.00) refreshing and made with Jallab Syrup - a mix of grape molasses, rose water and sugar. It was too sweet for my liking, still I did try it as the flavour was new to me. After drinks, we looked at the menu for the starters and the vegetarian menu is superb and you do have choices, we read through the whole menu card couple of times to fully understand everything and decided to have one cold starter Makdous (£3.75) - Baby aubergines stuffed with walnuts, spices and garlic. and two hot starter Batata Harra (£4.00) - Potato cubes sautéed with coriander and garlic, topped with fried vegetables and Fatayar (£4.00) - Pastry stuffed with spinach, onions, pomegranate and pine nuts. 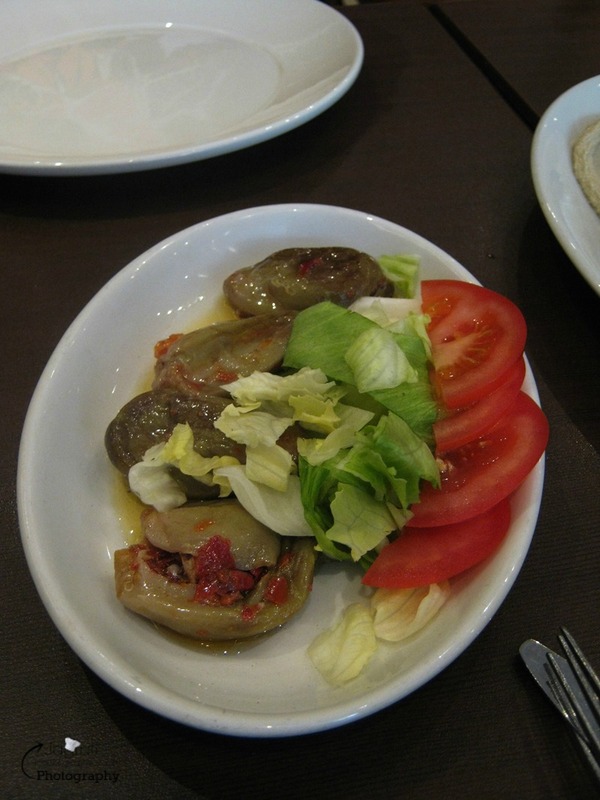 Starters were accompanied with two delicious dips and basic salads like lettuce, onion and tomatoes. Starters were delicious and phenomenal , totally new flavours for us. I would definitely order these dishes any time again. For the mains , we needed help as we couldn't decide what to order, so quickly we had little chit chat with the manager and decided to order..we had three dishes to choose from , we choose Mousaka'a Batinjan (£9.50) made with baked aubergine, chickpeas , tomatoes and spices, served with plain rice and Lebanese bread basket, decent size - the perfect portion for two. It was mild in taste yet flavourful. For the tea and coffee, we had three to four choices, because I wanted to complete the flavours of Labanese I chose Lebanese coffee over the latte and tea, the closest way to describe this coffee is to a Labanese version of a strong espresso , just spiced with two tiny cardamom pods, served in a traditional coffee pot with small 'shots' size of espresso glass. It was strong and nice, and a complete way to finish the meal. Overall, we left restaurant pretty satisfied. If you are a non vegetarian, this place definitely offers more. Portion sizes are reasonably good in comparison to price . Being a food blogger we always look out for presentation of the dish and obviously the quality/ taste too. I was little disappointed as dishes weren't presented well enough or I should say garnished, how we like to see, but I have to admit that taste was of high standard. 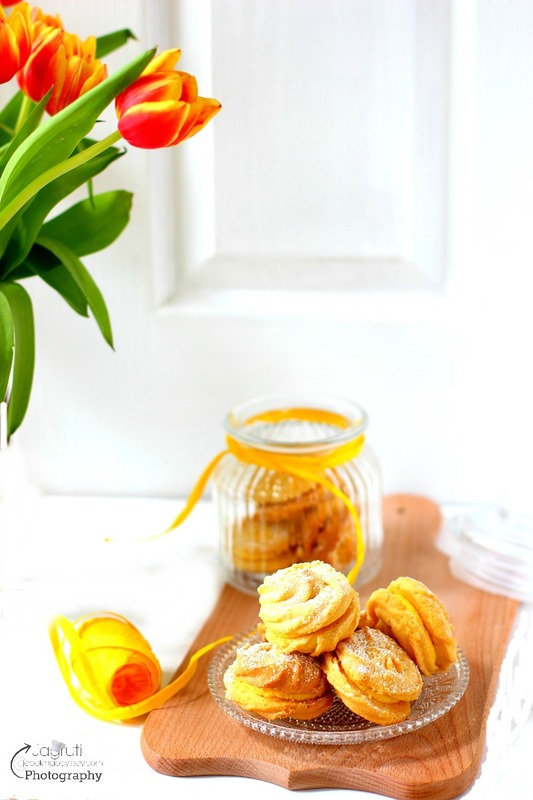 Dishes can be garnished little more. Would like the food to be served in a more authentic way. I would like to thank Karaam for inviting me at their restaurant to enjoy their hospitality. Disclaimer : - All the views and opinion about Karaam, are my own. I was not told or paid to write positive review. The food was on the house .